We are a bunch of dynamic and professional women who loves doing good in our community. Circle to us is about love, friendship and helping those in need. 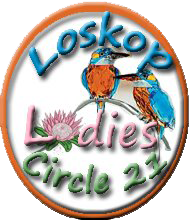 Colene Venter with the support of four other founding members, the support of Round Table Loskop 233's Chairman, Carlo Fourie and our Godmother Circle started Loskop Ladies Circle 21 in a small little town called Groblersdal. Helping the Abraham Kriel Orphanage, local community members in need and raising funds for a deaf child included some but not all of the projects Loskop Ladies Circle 21 was busy with and are still involved with on a daily basis. Our logo as per tradition contains our National Flower, the Protea and two Bushveld King Fishers which is a bird species found in our lovely region.